Welcome to Calypso Island! 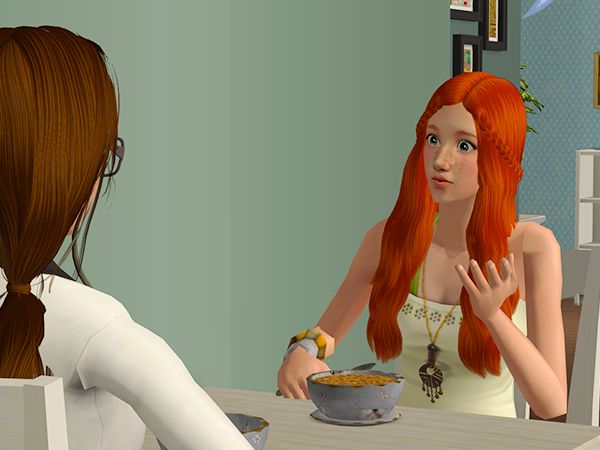 In this first update of the first week we'll meet Lily Burkett - a kinda shy family sim with a rather unfortunate romance secondary (unfortunate because shy and romance... yeah no XD). 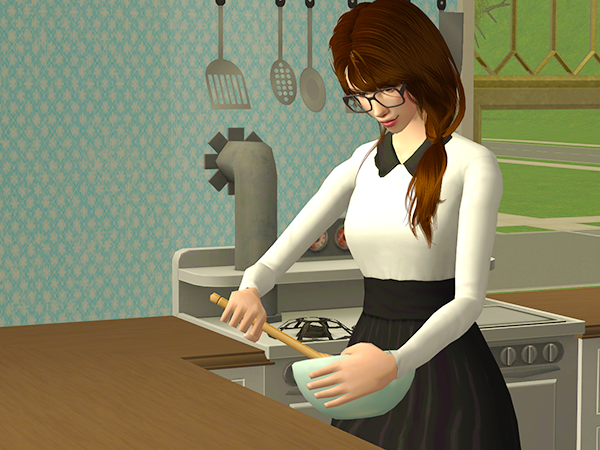 Lily will try her best to make Calypso Island into a thriving community. As Monday morning starts, Lily finds herself staring at the map of Calypso Island she put up last night in her "office" aka the corner of the living room. She thinks the map will be helpful in keeping an eye on her goals. The island is really big though, much bigger than it looked on the pictures. Lily doesn't really know what people expect of their leader. Someone who's approachable and caring, probably. 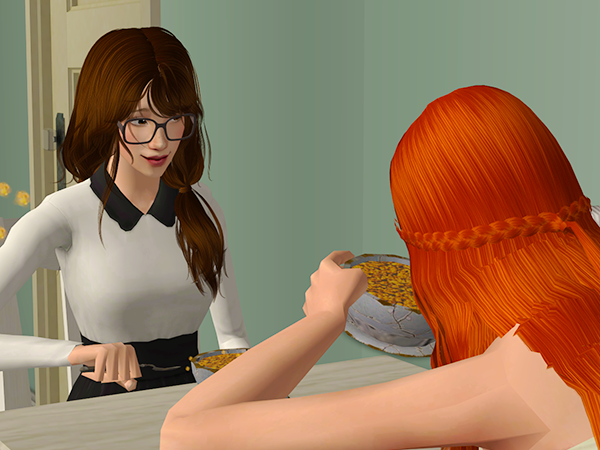 so Lily spends a good part of her morning calling the other settlers, making sure they settled in okay and to find out what they all need. Most of them are happy, though the lack of electricity takes some getting used to. 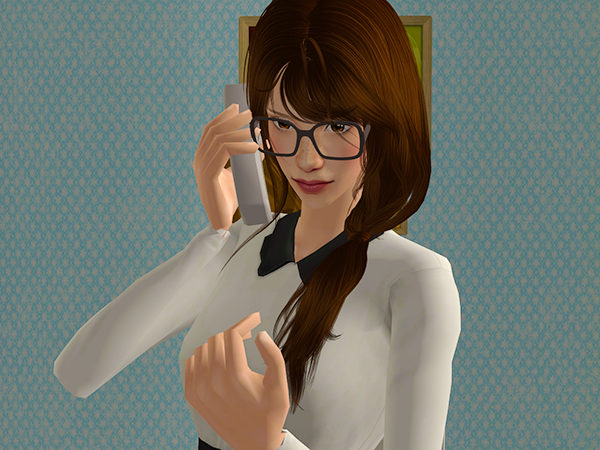 Summer Fueller's phone call takes over an hour, as Summer goes on and on about transportation, railways or even a ferry service to the main land. 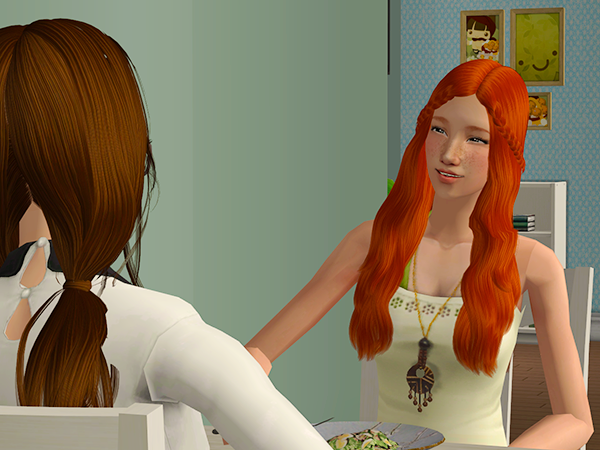 Summer decides to make a list of the things her fellow settlers want and then prioritizes them. And although a ferry or railway would be nice, electricity is much higher up on her list. Lily doesn't know much about politic, but she knows even less of electricity. She decides to invite Kevin Morgan over. He has a very high skill in mechanics, maybe he'll be able to help. 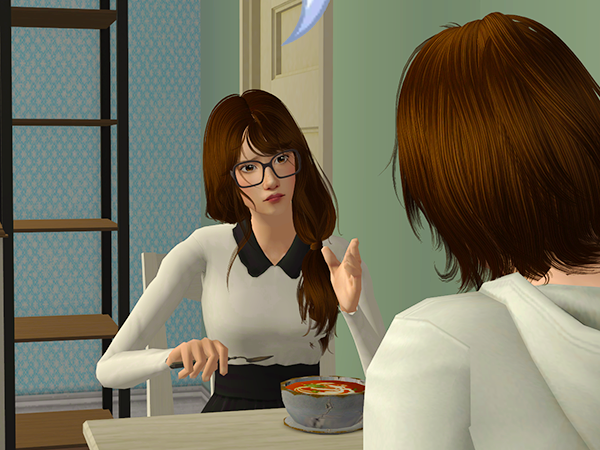 Over a nice meal of canned soup that Lily brought with her, Kevin explains the finer points of electricity. He has also brought a large supply of battery powered LED-lights and promises to make sure every household gets one, while he works out a solution to their situation. 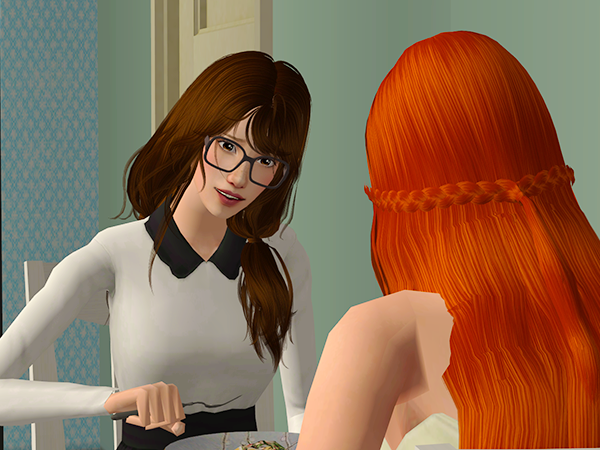 The next evening, after work, Lily tries to invite Summer over to talk transportation. 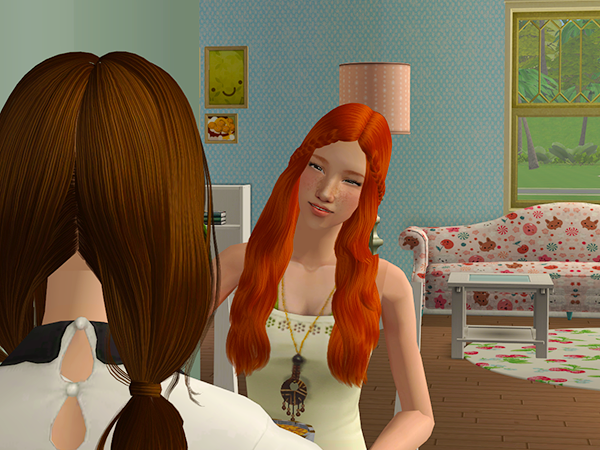 But Summer is busy making their new house into a home, so she sends Remi in her place. 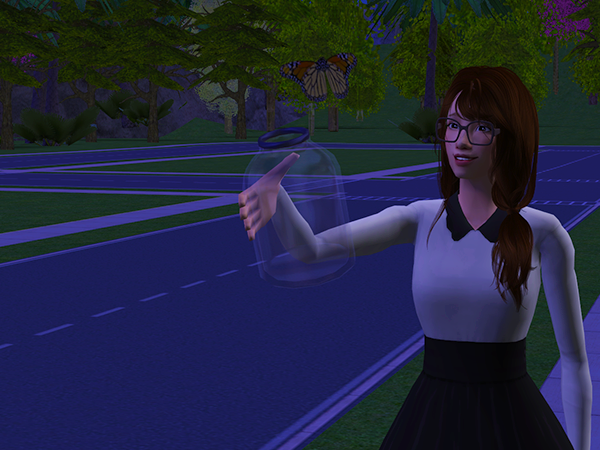 Remi isn't too keen on transportation, so they end up playing catch instead. The next morning, the phone rings. Lily expects it to be Summer, with another round of "trains trains TRAINS!" But it's Kevin instead. He's drafted up some plans and want Lily to take a look at them. Instead of a hug, Kevin greats Lily with a round of tickles. "So, Lily, tell me, do you play ball with all the guys, or is it just me?" "Uhm... well, I played catch with Remi Fueller last night..."
"... shouldn't we be discussing your plans now?" "And then, after we went inside, he kissed me! Yeah! Just like that." " I dunno, he left right after... No he didn't say..."
"Okay, I'm coming over RIGHT NOW!" "You need to tell me all about it! How was it? Is he a good kisser? I need details!" "Geez Terri, I don't know! It was... nice I guess." "Will you see him again?" "Of course I will. It's a small island, with only seven people." "Oh, you know what I mean!" " You know what you should do? Tonight is Bonfire Night right? You should host a party." "Yeah right, a party for just the two of us. I don't think so." "No silly! A party for all of us. And you can invite dear Kevin too of course. It'll be fun!" 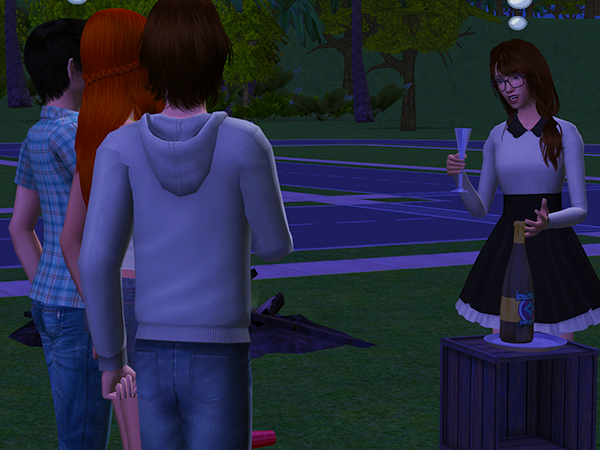 And so Lily found herself hosting Calypso Island's First Annual Bonfire Night Party. She invited all the settlers, but Summer and Rosie never showed up. Still it was a fun party. 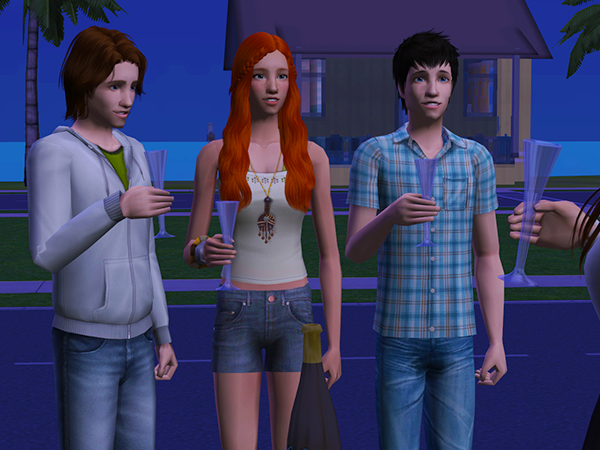 She held a toast, there were fireworks and drinks and everyone seemed to be having a good time. Until that terrible incident. Something with too much to drink, too many nerves and a weak bladder. Lily was mortified. "Kevin..." Lily wobbled slightly as she turned around. Kevin quickly grabbed her shoulders to keep her steady. "Everyone is wondering where you went." "I'm never going out there again!" "Oh, don't be silly. These things happen." "I'm not coming out though, forget it." "Sure you will. And otherwise I will drop by every day to drag you out, silly. We can't have our wonderful leader living like a hermit, now can we." "And then you kissed him?!" "Oh, you're so smooth, hahaha! Well, you know what's next, right?" "Invite the guy to a proper date!" She even dressed up for the occasion. Lily felt it was going overboard, but Terri, a hopeless romantic, wouldn't leave until she helped her dress. After that, there was no time to change back anyway. "I love it! It's a shame I can't take you anywhere, I would love showing off such a gorgeous date. I would love to take you to Londoste, or maybe the Lulu lounge and dance the night away." They did dance though. And although it was on the pavement instead of a trendy Simcity nightclub, nothing would ever beat the romance she felt in that sunset. "No Summer, this is not a good time to call me about a monorail system!" :D Glad you enjoyed it! Loved this so much. 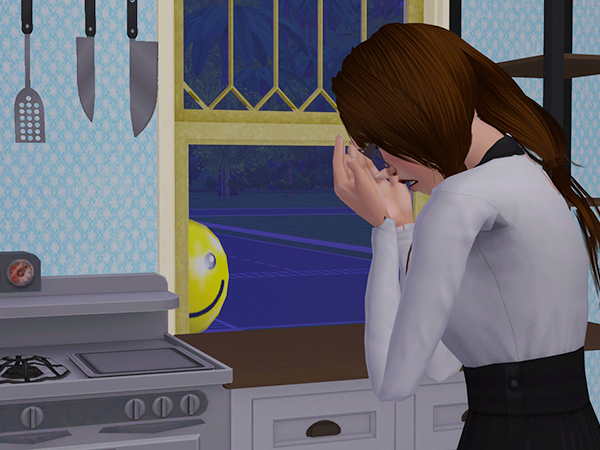 The sims are adorable and the story is well written. Can't wait for more! Aha I'm very excited about this! 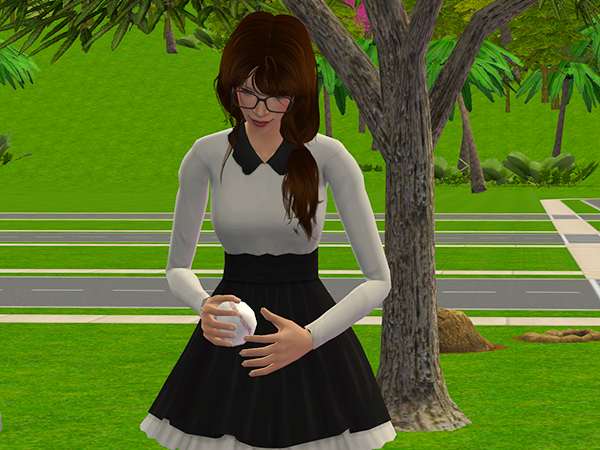 Super cute sims falling in love, that means super cute babies soon :3 and ooh pretty date dress! I'll admit I'm really curious about the babies too! XD It's the only thing I don't like about playing in rotations, I wanted to keep playing her :) And thank you! Great start! Can't wait to see what happens next. OMG, Lily is just the cutest!! 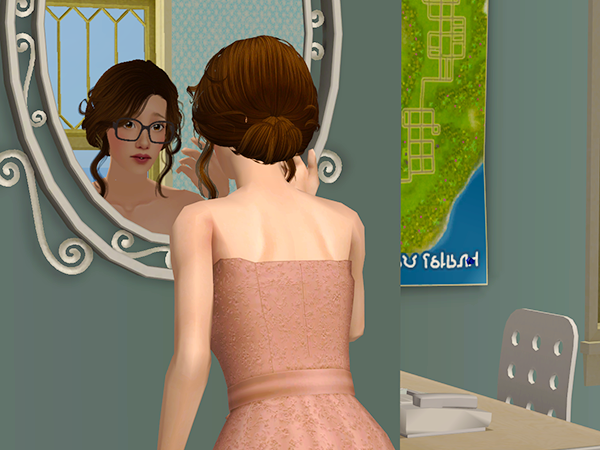 Love that photo of her all dressed up for her date :) Can't wait for the next rounds. Congratulations on a fantastic start!! Thank you! :3 I loved how she spend half the date looking awkward in that dress. And Kevin was autonomously appreciating and congratulating her all the time. I think he approved of her dress. Your characters have so much personality and they're funny, too! I'm looking forward to the next updates!